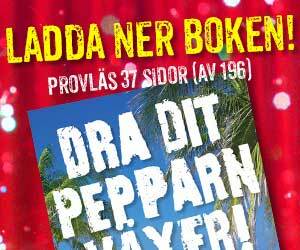 Adlard Coles är ett av världens mest kända förslag för båtböcker. Mina tre svenska böcker har också översatts till engelska, bearbetats ytterligare med lärdomarna från de svenska böckerna, och getts ut på de engelskspråkiga marknaderna. The first in a series of highly practical, hands on, step-by-step photographic manuals, Replacing Your Boat’s Engine fills a gap in the market for the DIY boat builder and repairer. It is a subject covered only in piecemeal fashion by the yachting press, which, like general boat repair manuals, can’t go into the level of detail Mike Westin does. This is a visual, hand-holding guide, dwelling on the practical details of replacing a boat’s engine and related systems as it explains each procedure rather than focussing on the theory (which is relegated to an appendix, for those who wish to go further). Anyone who wishes to upgrade their boat’s engine or replace an ailing or broken engine will find this step-by-step illustrated book a hand-holding godsend. 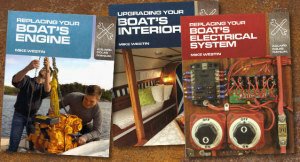 The second in a series of highly practical, hands-on, step-by-step photographic manuals, Upgrading Your Boat’s Interior fills a gap in the market for the DIY boat builder and repairer. It is a subject covered only in piecemeal fashion by the yachting press, which, like general boat maintenance and repair manuals, can’t go into the level of detail Mike Westin does. This is a visual, hand-holding guide, dwelling on the practical details of upgrading every aspect of a tired boat’s interior and related systems as it explains each procedure rather than focussing on the theory (which is relegated to an appendix, for those who wish to go further). It’s surprising how a few simple renovations and upgrades can transform the look and comfort of a cabin. Anyone planning to attempt these projects will find this photographic step-by-step book a hand-holding godsend.